Our 80+ miles of trails would not exist were it not for the generous landowners who allow us to use their property, both public and private. Please remember to treat the land, neighbors, and other users with respect when you are out on the trails. This includes traveling to and from parking areas, activity in parking lots, and use of the trails. Please refrain from riding wet trails. Check out our Conditions page for detailed trail status updates. Located in Colchester behind Costco, Sunny Hollow Park is an extremely popular network for beginner and intermediate riders. Both the Blueberry and East loops are ideal trails for beginners and easy to access. Intermediate and advanced riders can descend into a number of ravines and access further plateaus. Small plateaus and deep ravines allow for beautiful views throughout. The trails are in very close proximity to Burlington and Winooski, making the network a popular choice for after work rides. In recent seasons, Fellowship of the Wheel has built significant retaining walls, bridges, and re-routes to further improve ride-ability and sustainability for all trail users. The Sunny Hollow trails flow through public land—many thanks to the Town of Colchester for their generous access. A popular network for riders of all abilities. Mud Pond Country Park in Williston has been the focus of significant trail work over the last two seasons and will continue to be for years to come. Four trails weave through pine and deciduous forests. New trails begin partway through the network and are fast, swoopy, and smooth. 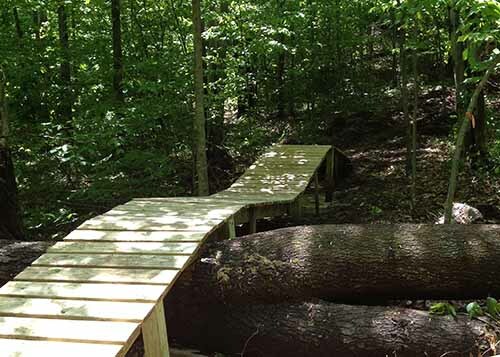 Unique bridges, varying terrain, and easy accessibility make Mud Pond Country Park a favorite. The Mud Pond trails are built on a mix of public and private land—many thanks to both the Town of Williston & The Herskowitz Family for their generous access. The trails on the Carse property between Lincoln Hill and Hollow Road in Hinesburg are some of the best in VT. Big climbs and over 10 miles of epic singletrack on 1000 acres of land contiguous to the Hinesburg Town Forest. Large old growth trees, gorgeous meadows with spectacular views, and a classic ridge line are not to be missed. FOTW has committed significant resources to this network over the past five seasons and has created a real gem for advanced riders. Instant classics like Henry’s Highlands, Preacher, Crucible, Pinner, and Voodoo Child have been meticulously constructed and are quite popular. Most trails are characterized as a combination between technical and flowy. Trails are designed to challenge riders on climbs while allowing for higher speed descents. The most advanced trails incorporate freeride options such as rock faces, jumps, and wooden features. Many thanks to Henry Ralph Carse for generous access to his private land. 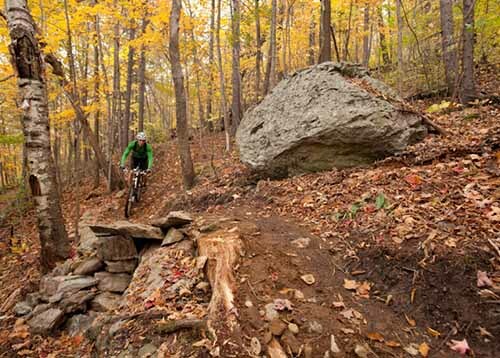 The Hinesburg Town Forest boasts 18 miles of singletrack spread through 850 acres. The history of the land includes early 20th-century farming and you can occasionally see old rock walls, foundations, wells, apple trees, and other signs of a bygone era. Trails are primarily “old-school rake-and-ride” and are therefore quite challenging. There are very limited options for beginner and intermediate riders. Set in the middle of three contiguous networks, the Hinesburg Town Forest is an excellent jumping off point for some of the longest, most challenging rides in VT. Head up and over to the incredible Carse Hills trails to the south or climb up to the Butternut Cabin at Sleepy Hollow to the north. The Hinesburg Town Forest is also very popular for hiking, snowshoeing, and hunting, with occasional permitted use of ATV’s and equestrians on the town-maintained Eagle Trail. 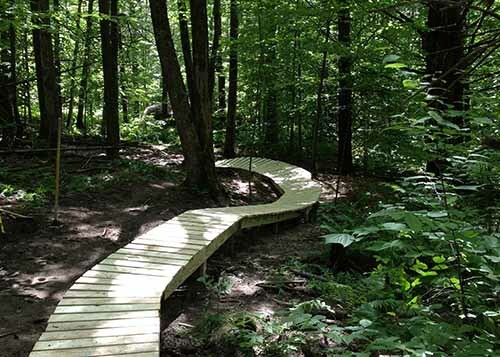 The Hinesburg Town Forest trails are on public land managed by the Hinesburg Town Forest Committee—thanks to the Town of Hinesburg for their generous trail use access. An incredible 30-mile pay-to-ride network of trails in Huntington. Sleepy Hollow is a mecca for advanced and expert riders. 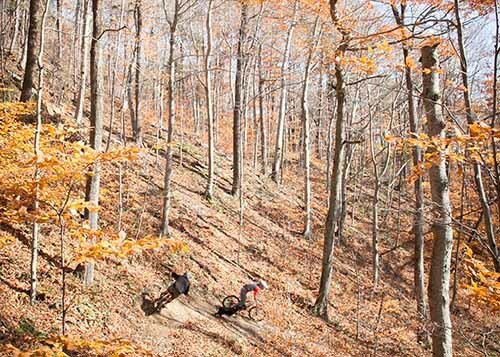 A mix of beautiful “rake-and-ride” and fast and flowy, rolling descents. Riders have the option to climb to Butternut Cabin and take in spectacular views of the Green Mountain spine. From there, one can choose to continue through a fantastic network or descend to the base of the Hinesburg Town Forest (and beyond to Carse Hills) for an all-day epic or shuttle. Fellowship of the Wheel and volunteers have assisted in the improvement of this network. An intermediate loop is now possible and joins the rest of the loops at their conclusion for an exhilarating, smooth descent to the parking area. PLEASE PAY OR SIGN IN AT THE OFFICE and NO DOGS. 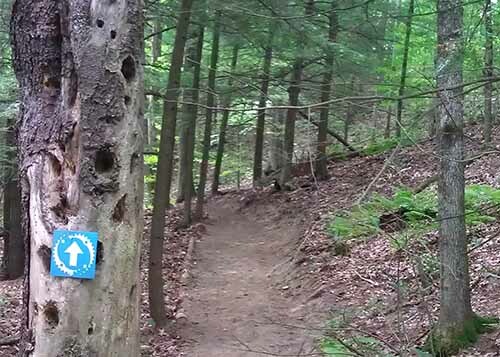 The Sleepy Hollow trails are on paid-access land—many thanks to the Sleepy Hollow Ski & Bike Center for their continued support of our partnership. New for 2019, you can get a year round pass to biking trails Catamount by selecting it as an “add-on” when you sign up for your Fellowship and VMBA membership! A stunning pay-to-ride center home to youth camps, running and mountain bike races, weddings, and events. The property at Catamount is listed by the Vermont Division for Historic Places and the national Register of Historic Places. The land is situated on two hills affording vistas that include the Green Mountains and the Winooski River Valley in the east and the Adirondacks and Lake Champlain in the west. A pleasant combination of woodland, pasture, and cropland combine with mostly gently rolling terrain to make this 500 acre property a gem. Catamount Outdoor Family Center is especially friendly to beginner and intermediate riders. 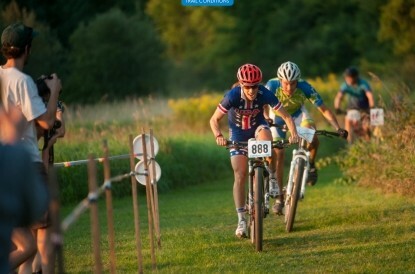 It is a fantastic place to rent bikes, sign up for camps, or challenge yourself by racing. PLEASE PAY OR SIGN IN AT THE OFFICE and NO DOGS. 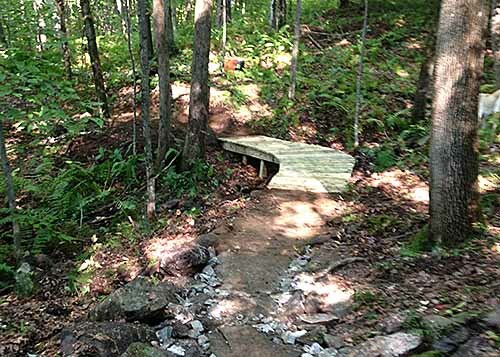 The Catamount trails are on paid-access land—many thanks to the Catamount Outdoor Family Center for their ongoing support of our partnership. The conserved Mobbs Farm in Jericho is home to ten miles of trails for intermediate to expert riders. On the hill side of the network, trails are classic “rake-and-ride”, including a number of rock ledges and even old “Americana.” Down in the valley, trails wander through a beautiful meadow and descend to the Mill Brook. Numerous secret swimming holes abound—Mobbs Farm is a favorite area for walkers, dogs, equestrians, hunters, and mountain bikers. The Mobbs Farm trails are on publicly conserved land—many thanks to the Town of Jericho and the Mobbs Committee for their generous trail access.